As I work through my recovery for my binge eating problem, I have become a crier. It's great, really - collapsing on the couch or into my bed and sobbing can be incredibly cathartic. Learning to let the emotions out instead of packing them down with food is very important. Sometimes, though, it feels silly. Like when I cry over the most ridiculous things. The other day, it was Whole Foods. Specifically, the fact that I don't drive and the closest Whole Foods is over 50 miles away. Trader Joe's, too (though, admittedly, I never went to Trader Joe's when I lived in the Midwest. It wasn't really close by - they finally put one close-ish to where I was living, and it opened a few days after I left.). After my Whole Foods challenge this summer, I got kind of spoiled - so many wonderful veggies and grains! I miss the glorious produce section, the fresh fish counter, the bulk bins. Since moving to my new city, I've been frustrated a lot by the grocery stores here. The selection isn't nearly what I had available in Chicago, in terms of both the stores themselves and what they sell. There are a few grocery stores near my apartment, yet the choices are lacking. I couldn't find Chobani at all until the local Target finished remodeling and added a grocery section. I still haven't seen collard greens, kale, or escarole. And the prices are surprisingly high considering so much is grown/produced right here in-state. Things I used to keep on hand all the time back in Chicago have now become "sometimes foods." Things like ground turkey - I can't believe I used to scoff at $2.49 for a 16 oz. container. I'd wait for it to go on sale 2/$4 or cheaper. Now, finding the same ground turkey for $3.99 is a bargain. I used to buy hot Italian turkey sausage, too, for the same price - at 140 calories a link, I'd slice one open, form it into a patty, and make a nice sandwich for lunch on the weekends. It's hard to justify the expense, though - upwards of $4.99 for 5 links - so I stick to just plain chicken breasts. I also used to like the Amy's frozen meals - as far as frozen meals go, they're a more "whole" alternative compared to the Lean Cuisines - but they're twice the price here that they were back in Chicago. (And they were expensive back in Chicago!) I want to nourish my body the best I can, but I also can't see spending $6 on one frozen meal. I suppose it's comparable price-wise to going out to eat for lunch, but I very rarely go out to eat, too. I'm a penny-pincher who made a healthy lifestyle rule against going out to eat except for social situations. On weekends, I try and avoid the frozen meals since I have more time to put together something real. Ideally, I'd like to transition to homemade meals for every meal, but for now, it's one step at a time. I spend Saturday or Sunday cooking up soups and putting together containers I can freeze and take out during the week as need be. It's not hard to make these things, just a little time consuming. It's certainly worth the effort, though. 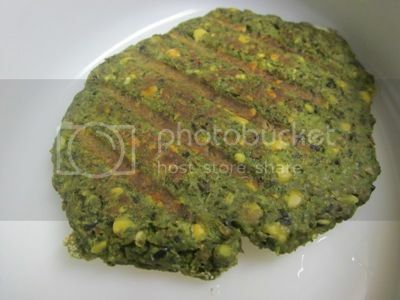 Something rather easy to make (and freeze) are the veggie burgers I've been craving lately. They're quick to throw together, filling, and have pretty much unlimited possibilities as far as flavors go. Last week, I wanted curry and coconut - so I made it happen. This week, it was olives - my sister made an amazing olive hummus when I was home over winter break, and thinking about it had me craving these hummus, broccoli slaw, and collard green pinwheel sandwiches we had at one of our Whole Foods cooking classes (cue my tears). 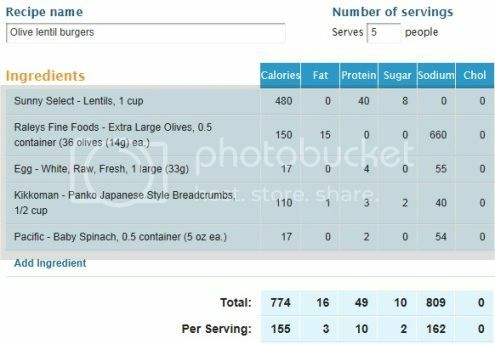 So, I did some investigating, and I found a recipe for olive lentil burgers by Isa Chandra Moskowitz. Per usual, I did some tweaking (surprise, surprise, I couldn't find cremini mushrooms), but I absolutely loved the end result. Preheat oven to 350º. 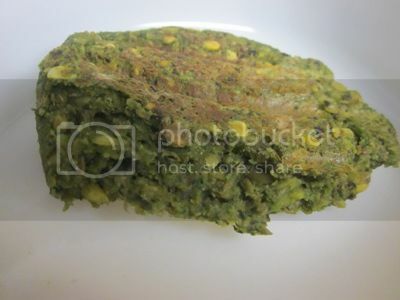 In a food processor, finely chop spinach. Add olives and pulse, leaving them slightly chunky still. Add cooked lentils and pulse until well-combined, but not entirely smooth. Transfer mixture to a medium-sized mixing bowl. Add breadcrumbs and egg white and stir until well-combined. Form mixture into 5 patties and bake for 10-15 minutes per side. Per usual, I made mine on the ol' George Foreman. They took a bit longer to cook than bean burgers usually do - the mixture was a bit creamier than my usual piecemeal bean mix. But oh, so worth it. To be honest, I could also see myself skipping the breadcrumbs and egg white and just eating the lentil/spinach/olive mixture, spreading it on a pita or dipping in carrots or other veggies. As burgers, though, they were quite delicious, and I can't wait to find some mushrooms so I can attempt the original recipe! What about you? Are there any foods you enjoy but have trouble justifying the cost? What are some of your favorite lunches? Very interesting! This is probably a stupid question, but are those just regular green olives that you used? I have a hard time justifying the cost of MANY things--I've never even tried the Amy's meals because they cost as much as a home-cooked meal for my entire family. Larabars are another one--I love them, but they are $1.89 each. So I only buy them when they are on sale for $1, and even that seems like a splurge! Those sound absolutely delish. I need to go back and read all of your food posts and make a list so I can buy the ingredients and make some of this stuff! And if I lived in Cali, we'd totally have weekly Whole Foods (aka "Whole Paycheck") and Trader Joe's trips. For sure. "Whole Paycheck"! LOL! In Seattle, we have a local food co-op called "PCC" which my friend calls "Pricey Consumer Co-op"! LOL!!! The thing is with these health food places is that they are FULL of boxed processed food. That isn't healthy either. It is much better, for example, to eat soy *beans* than to eat processed-all-to-heck soy fake food. Makes no sense. They sound great apart from the olives!! The one food I will never eat. The PPK has the best recipes ever. I live in Podunk, the produce choices here are embarrassing. I drive about 50 miles on weekends and stock up on fresh veggies. I can make oranges and apples from here work as fruit if I have to, but not in the summer. I go to the little old guys selling from the back of their pick-up trucks on the side of the road. I get so upset just thinking about the lack of fresh choices here.